Crown Heights North III HD. Image Credit: LPC. Largely developed between 1870 and 1930, primarily residential neighborhood served as home to Shirley Chisholm and Richard Wright. 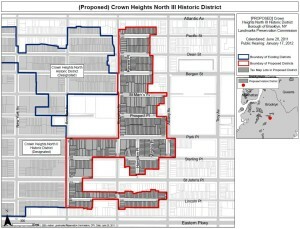 On March 24, 2015, the Landmarks Preservation Commission voted to designate the Crown Heights North III Historic District. Landmarks previously designated the Crown Heights North and Crown Height North II districts in 2007 and 2011, respectively. The new district, composed of approximately 640 buildings, is contiguous with those previously designated, and possesses a similar development history as well as typologies of architecture. The district earliest extant buildings are rowhouses dating to around 1870, though the district did not begin rapidly developing until the 1888 opening of the Kings County Elevated Railway. The residential neighborhood was primarily characterized by Renaissance Revival rowhouses in the late 19th century, still a predominant housing type in the district. The early 20th century saw the construction of four-story, two-family duplexes known as “Kinko Houses,” as well other multi-family flats buildings. The district also includes the 1925 Shaari Zedek Synagogue, which served the City’s largest Conservative congregation. The district later attracted a large African-American and Caribbean-American population. Shirley Chisholm, Democratic Presidential candidate, and the first black female member of Congress, lived in the district for a large portion of her life. Native Son author Richard Wright also briefly resided in the district in the 1940s. Wide support for designation was voiced at hearing in January of 2012 by residents, preservationist and community organizations, and representatives of elected officials including then Council Members Albert Vann and Letitia James, and Borough President Marty Markowitz. Chair Meenakshi Srinivasan stated that subsequent to the public hearing on designation, the commission had received letters in support of landmarking form Brooklyn Community Board 8, Council Member Robert Cornegy, and the Crown Heights North Association. Chair Srinivasan said the “cohesive” district displayed an “amazing collection of buildings and styles,” and she was “happy to bring it to fruition.” Srinivasan also found the district’s rich social and political history meritorious of preservation.” The commission voted unanimously in favor of designation. The designation brings the total number of landmarked buildings and sites in the Crown Heights area to 1,752. LPC: Crown Heights North III Historic District, Brooklyn (LP-2489) (March 25, 2015).